So your new novel, Cinema of Shadows, takes place in a haunted movie theater. 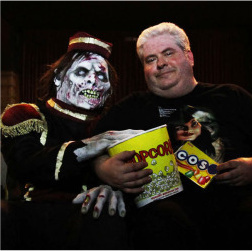 I know you have a lifelong interest in film and in horror films specifically. Did you pursue an education in film? Oh yes. I studied film and television. I wanted to be the next Steven Spielberg or James Cameron. Growing up, I would write screenplays for movies I would make with my friends and my parents’ video camera. When I saw the film Super 8, it really took me back, because that was me and my friends at that time. How does writing a script differ from how you approach a novel? In terms of plotting and dialogue, I really don’t approach them any differently. In fact, I often read my dialogue aloud, to make certain it sounds authentic. Where they differ is how you convey character. In a screenplay, you have to do it all with dialogue and visual detail. With a novel, you can be inside someone’s head. You can get to know how they think and feel. It’s more intimate, and it leads to a much stronger connection and emotional investment. I read that Cinema of Shadows taps into the “ghost hunter” subculture. LOL…T.A.P.S. Yes. My sons and I are huge fans of Ghost Hunters,Ghost Adventures,and what have you. But, when you watch these shows, you’re waiting for them to walk into the Amityville Horror house, into the house from Poltergeist. You want chains to rattle and walls to bleed. You want to see ghosts, and it just never happens. So, with Cinema of Shadows, I wanted to create the scariest haunting I could imagine and then have my team actually get to deal with it. Those “ghost hunting” groups have exploded across the country in recent years. What sort of research did you do to keep your “team” authentic? That authenticity was something I really wanted. I hadn’t seen a lot of paranormal research using scientific methods in fiction before. So, in addition to speaking with researchers about how they would approach certain situations, I actually took part in some investigations; the Hanna House in Indianapolis, and the Woodcarver’s Building in Converse, Indiana. I used all the equipment that, up until that point, I’d only seen on television. And I witnessed things, felt things that I couldn’t explain. So, in addition to the technical aspect of an investigation, I was also able to draw from my own feelings and experiences to paint a very vivid picture. Like me, I know you share some great memories of the Eastwood Theater on the east side of Indianapolis. For me, personally, that was THE theater to see the original Star Wars trilogy, Fright Night, and I also remember their experiments with classic 3D films when attendance was slacking off. How do you think those experiences differ from today’s moviegoing experience? There is something to be said about going to a theater that doesn’t have a screen the size of a postage stamp, to seeing a film projected in 70 mm with six-track Dolby sound that makes the concrete shake beneath your feet. Going to movies back then was a real event, and I miss those days so much. The closest I come to that experience now is taking the kids to the IMAX, but it’s not the same. How have you used those memories in CoS? I tried to convey that sense of loss when the characters first enter the Woodfield Movie Palace and see what it has become. It’s so tragic to see the movie palaces disappearing from this world. The architecture alone was just amazing; grand balconies, gold molding, statues and chandeliers in the lobbies. All the neon! There are still some out there. Working theaters, like the Artcraft in Franklin, Indiana, that show classic films on the weekends, or converted into concert halls for bands and comedy shows. I based The Woodfield Movie Palace in part on the Crump in Columbus, Indiana, and we were lucky enough to be able to film the book trailer for Cinema of Shadows there. So sad to see the walls crumbling and the paint peeling. I stood on the balcony and tried to imagine what it must have been like to see a movie there, back when everyone in town would meet up and be transported to another place and time. What is on the horizon for you in terms of future book releases? I have more novels for Seventh Star Press that will be set in Harmony, Indiana, the same town that served as the backdrop to Cinema of Shadows and my first novel, The Wide Game. (Read R.J. Sullivan’s review of The Wide Game here.) Spook House is the next one, and it will be out late in 2012. I also have a dark, epic urban fantasy series titled The Legacy of the Gods on the horizon. Look for an announcement on that very soon. And I am editing an anthology for Ambrotos Press called Vampires Don’t Sparkle! for all those Horror fans who want to read gritty tales about vampires who don’t mope and brood about going to prom. That will be out in the first half of 2012. I have thoroughly enjoyed my participation during my short time in the Indiana Horror Writers. Tell us a bit about the history as a founding member and as your current role a president. Explain the overall goals of the IHW, what it does and what it plans to do. Where can readers find you and learn more about your work? Faithful readers can always find me at my website, http://www.bymichaelwest.com, or on Facebook and Twitter. You can find my short story collection, Skull Full of Kisses, and my debut novel, The Wide Game, at Graveside Tales. 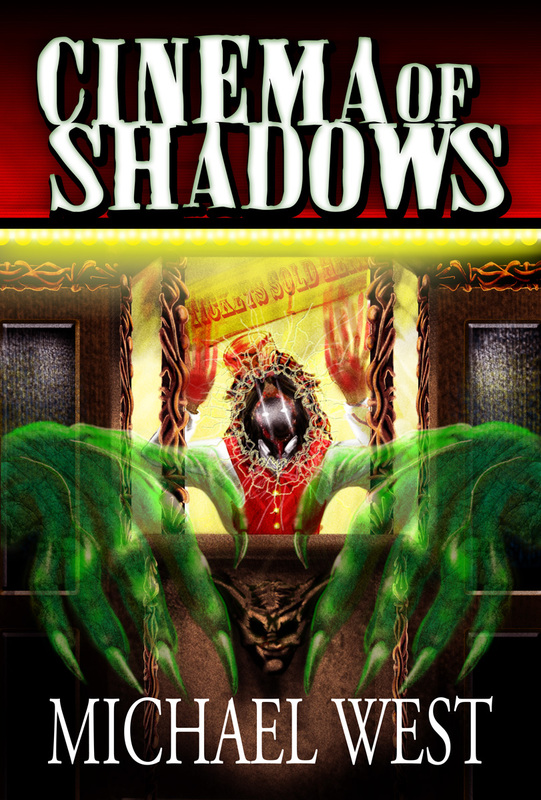 Cinema of Shadows, and future Harmony novels, can be found at Seventh Star Press. This entry was posted in Discussion, Interview. Bookmark the permalink.